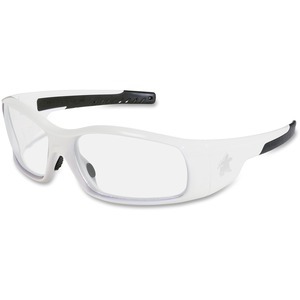 Safety glasses feature a sleek, modern design that lets you make a bold statement. Exclusive Duramass scratch-resistant lens coating protects the lens to maintain a high level of visibility. Soft TPR material on the temples is coupled with TPR nose pads for comfortable use during extended use. Wide bayonet temples provide better side protection. Strong polycarbonate lens blocks 99.9 percent of harmful ultraviolet rays for added protection.